"The art-world antidote to 'the bloated, over-sized art fair model'"
"The second annual Superfine! Art Fair... once again blur[s] the line between performance and immersion." "Based on clear art market trends, Superfine!, as a model, deserves a closer, more generous look"
"The inaugural edition of Superfine! New York in 2017 might have been the only time I’ve ever enjoyed being at an art fair." "If you know me at all, you’re aware that I’m a Superfine! super-fan." "Superfine! is one of the most charming satellite fairs"
"the art fair that won’t break your bank"
"a cutting-edge marketplace where buyers, sellers, and artists can operate transparently on an even plane"
"Art Basel and Miami Art Week, at heart, are a rich person's playground, full of white tents housing bajillion-dollar works of art... But then Superfine! hit the scene." "'Superfine! The Finest Fair' is the locally rooted, globally influenced affordable art fair which brings together over forty international exhibitors showcasing their representations." "French perfumery and fragrance house, CARON, is partnering with Superfine! The Fairest Fair for an interactive art installation created by local Miami Haitian artist Asser Saint-Val." "From taking a look at their line-up online, I knew Superfine! would be full of new and exciting works, so I had great expectations when I walked in." 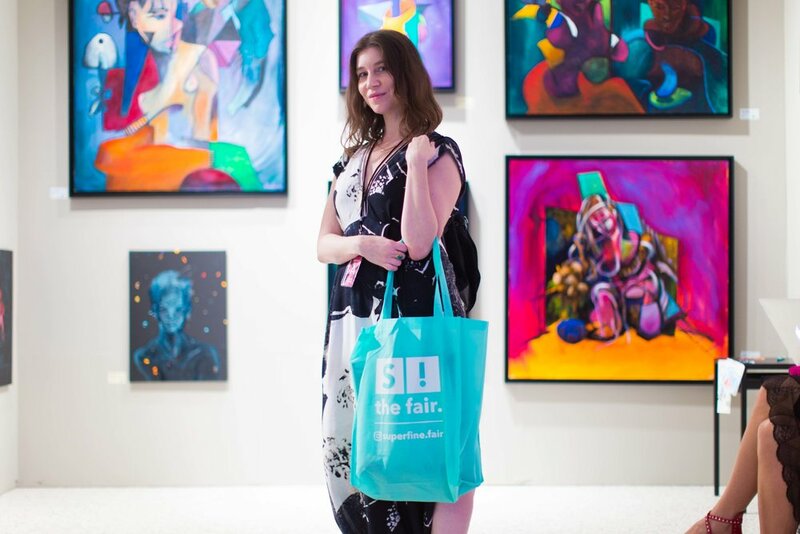 "the SuperFine Art Fair provides emerging artists a place to connect with eager art buyers on a slightly more realistic budget than Basel proper." "'It warms my heart to see that these artists are feeling good and excited...' He's talking about the feeling of selling an art piece." "Superfine! is an art fair not to be missed. However, just in case you do, this Miami-based organization offers programming throughout the year." "Mitow founded Superfine! to build a bridge between artist and collector that makes the process of attending an art fair transparent and easily accessible." "With works that range from several hundred to under $5,000, you might just be able to call yourself an Art Week collector." "The resident artists will exhibit at the Superfine Art Fair during Miami Art Week"
"Unlike most fairs, which focus on galleries, individual artists are among the 30 exhibitors, about half from South Florida." "True to its name, Superfine!’s values are rooted in providing an equitable alternative to the typical white-box space by presenting artwork that is affordable and representative of the local art scene." "Superfine!’s aims go beyond putting on a fair (an undertaking in itself). They aim to rebuild the fair model from the ground up, not just tweak and modernize the fair concept." "Alex Mitov, an American with Bulgarian roots makes one of the most popular festivals in Miami." "The event subverts the typical fair, opting for a hyper-curated environment over stuffy warehouses." "Superfine! aims to attract art lovers of all demographics and income levels." "This fair may cause a serious shift in how art dealings take place in the near future." "Their success is proof of their prowess and the validation that the stuffy rules of the artworld need to be reevaluated." "Part of the fun of art fair weeks is checking out new art fairs to the scene. This year is no exception." "Geared towards young professionals, the fair has something for everyone." "Affordability is a point of pride for the organisers." "This Miami-based fair with a perky name is making its first stop in New York." "In a time where art fairs are coming to New York by the hundreds and you have an ample selection to choose from, Superfine! sets itself apart from other fairs." "Superfine! places an emphasis on emerging artists with price points for every budget in a fair that aims to close the gap between the art-appreciating public and the art collecting one." "The funky, manageable fair with a range of artists who some might call "outsiders" but who are really right in the middle of what contemporary art is all about. Or what it should be all about." "Superfine! prides itself on setting the standard for an affordable fair that serves not only serious collectors but the art loving public as well." "Great art always evokes feeling and conversation, and that’s just what Superfine! sets out to do." "Other events during Frieze Week will include...Miami transplant Superfine!" "MIAMI'S SUPERFINE! FAIR BRINGS "COLLECT ART NOW" MANTRA TO FRIEZE WEEK 2017 IN MEATPACKING DISTRICT"